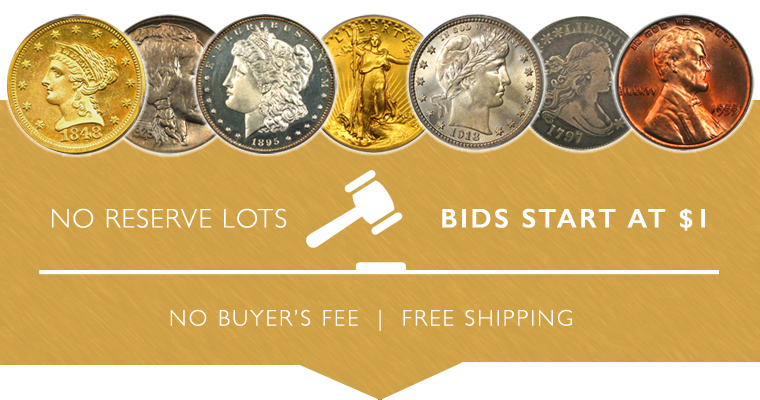 Auction #1033 Lots Live Now! Browse & Bid Today! Our first highlight coin is a 1908-D 25c PCGS/CAC MS67+. This premium plus graded, CAC approved piece has gorgeous sea foam green tints with a light rose highlight. It is a beautiful, superb gem that is tied for Finest known with one other coin. This week's second highlight is a 1910 $2 1/2 PCGS/CAC Proof 66. A gorgeous matte proof Indian Quarter Eagle that is incredibly rare with the coveted CAC seal of approval. There are only three pieces that are graded finer by PCGS, and the amazing eye appeal makes us imagine that none could possibly be more attractive. This week's third highlight is an 1854-O $3 PCGS/CAC AU58. We are proud to offer this popular and scarce New Orleans $3 gold piece. This coin comes from a mintage of only 24,000 coins of which no finer pieces are CAC-approved. Our final highlight is an 1864-S $5 PCGS/CAC AG-03. This coin is a very tough Civil War era gold piece that was struck at the San Francisco mint. Only two pieces have been offered in the past decade (Sept 2018), and this example is especially wholesome on the obverse, and has garnered the CAC seal of approval. Of course there are many other highlights, so be sure to browse all lots in this exciting new sale before it closes on Sunday, October 7th.